Martucci tended to write with greater panache and effusion for his own instrument, the piano, than for the violin. It makes the vogue for his Second Piano Concerto the more explicable and, indeed, ASV�s championship of his orchestral music has brought the body of it to widespread international attention. The violin works here, however, are slighter. The Sonata was written when he was eighteen and is full of youthful lyricism, a degree of academicism and a healthy dose of Schumann, always a compositional lodestar for Martucci. The slow movement is laced with pizzicati though the finale, as so often, is rather conventional and derivative. The Tre Pezzi were written over a decade later, in the same year in fact as Franck�s Violin Sonata. The first adds Brahmsian figuration to Schumannesque lyricism and is serenely untroubled. The second is more pensive and the third is warmly ripe in its romanticism. The last of Martucci here is the salon-esque Melodia. It�s a quirk of fate perhaps that for many years Martucci was seen rather more as Respighi�s composition teacher than as a composer in his own right but it�s not inappropriate of course to bracket them thus together. The pupil�s Cinque Pezzi date from the first decade of the twentieth century and inhabit the light genre. 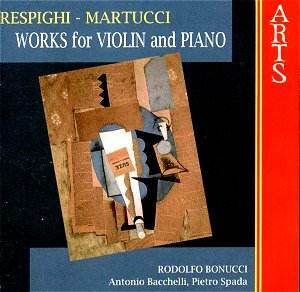 Those expecting the more mature and violinistically intriguing Respighi should not bring excessive expectation � these are salon style and very effective. They�re written very much in morceaux, Salut d�amour vein. The Humoresque is the pick of the bunch � nostalgic, lyrical, with some fluttery figuration to add a bit of zest to the violin line. Finally the 1901 Sei Pezzi, which are similarly pleasant and unambitious. Respighi�s gift for melody will always rise above generic material however and his handling of the Waltz is admirably amusing. So some fairly lightweight things here. They�re played with commitment and just the right kind of discretion. Both pianists are supportive � Spada accompanies for the Respighi � and violinist Bonussi is attuned to the genre. There are times when his slow vibrato is a hindrance � it makes the Berceuse from the Cinque Pezzi sound as if it�s played on a viola and he could certainly vest more tone colours to enliven these works with more glint � but he�s adroit and musical. Pretty reasonable notes as well � an enjoyable, relaxing recital.